The president spoke at the Flight 93 memorial in Shanksville, Pennsylvania, where one of the hijacked planes crashed. First, right after 7 a.m., Trump, appearing to quote from a Fox Business Network segment, tweeted, "'We have found nothing to show collusion between President Trump & Russia, absolutely zero, but every day we get more documentation showing collusion between the FBI & DOJ, the Hillary campaign, foreign spies & Russians, incredible.' @SaraCarterDC @LouDobbs." She appeared on Dobbs’ show on Monday to discuss the topic. New Strzok-Page texts reveal “Media Leak Strategy.” @FoxNews So terrible, and NOTHING is being done at DOJ or FBI - but the world is watching, and they get it completely. The president then retweeted a 9/11-related post by Dan Scavino, his social media director along with the hashtags, "NeverForget" and "September11th." Moments later he wrote, "New Strzok-Page texts reveal 'Media Leak Strategy.' @FoxNews So terrible, and NOTHING is being done at DOJ or FBI — but the world is watching, and they get it completely." Strzok's lawyer, Aitan Goelman, responded Tuesday that client was not referring to leaking to the media — but a strategy to prevent leaks. "The term 'media leak strategy' in Mr. Strzok's text refers to a Department-wide initiative to detect and stop leaks to the media. The president and his enablers are once again peddling unfounded conspiracy theories to mislead the American people," Goelman said. And at 7:41 a.m., again appearing to quote from a Fox Business segment, Trump tweeted, "'ERIC Holder could be running the Justice Department right now and it would be behaving no differently than it is.' @LouDobbs." Trump then tweeted praise of his personal lawyer Rudy Giuliani, who was the mayor of New York City on 9/11. "Rudy Giuliani did a GREAT job as Mayor of NYC during the period of September 11th. His leadership, bravery and skill must never be forgotten. Rudy is a TRUE WARRIOR!" Trump tweeted. 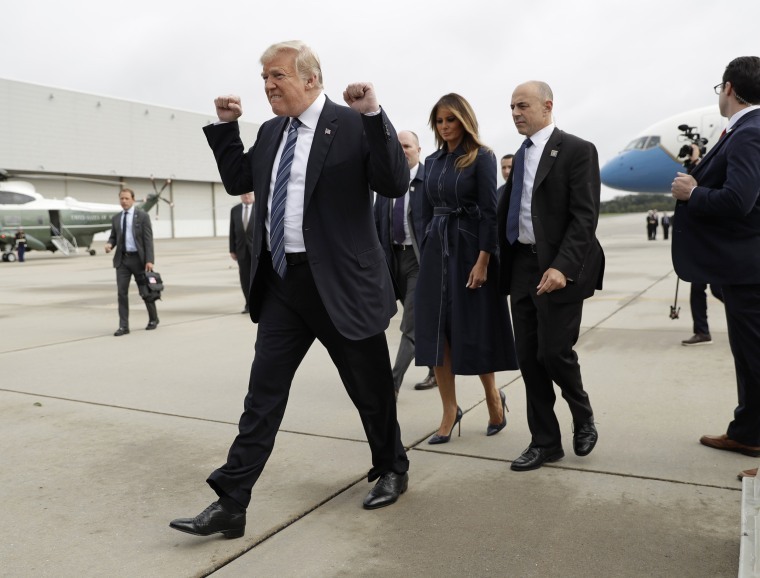 Later, the president tweeted that he was, "Departing Washington, D.C. to attend a Flight 93 September 11th Memorial Service in Shanksville, Pennsylvania with Melania," with the hashtag, "NeverForget," before tweeting a declarative: "17 years since September 11th!"